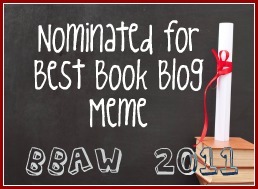 We were informed by the lovely folks heading up BBAW that there was an issue with the Best Book Blog Meme category and all votes are gone and will need to be voted on again. So, whether you are voting Top Ten Tuesday or another meme...please go vote again here! And if you haven't already voted on all the other categories, you have until the 10th I believe! All you need is a Twitter account or a Google account!